02/06/2001 - We've been together a month today! So, we've made a few minor changes to the site. No Sprinkles Pics yet. 02/24/2001 - Rudy moves to Austin today. Pris' brother and mother help Rudy our by giving him a bed, microwave, chairs, and a card table. 02/26/2001 - Rudy started at Dell today! 03/06/2001 - We've been together 2 months now! 03/24/2001 - Our parents meet for the first time. Nothing major, just hellos and lunch at a raunchy Mexican resturant that no one but Rudy liked. Rudy's dad orders him to find a better resturant for their next visit. 04/06/2001 - We've been together 3 months now! So we spent the weekend together, having fun in Waco including watching Murder in the First and playing many games of Connect Four. 04/13/2001 - We made Sonia, Rudy's little sister, an Easter basket. Sonia loved the basket, and was totally hyper the whole weekend! We also watch Along Came a Spider and Emeril Live. 04/15/2001 - Priscilla goes to Austin to help Rudy move in their new living room furniture. 04/16/2001 - Priscilla wakes up "sore like a mother" as she would say from moving furniture from the parking lot to Rudy's apartment. 04/20/2001 - Sprinkles ran a suicide mission and has gone to Heaven. 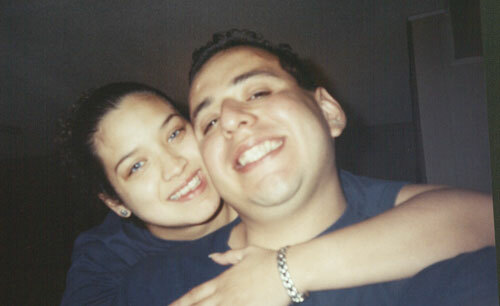 04/21/2001 Priscilla and Rudy are now engaged!! No one saw it coming, so Rudy popped the question. After a few moments, Priscilla said yes!! Everyone keep May 25, 2002 open for a wedding blast like no other, in New Braunfels, Texas. 04/27/2001 - Priscilla and Rudy make an appearance at the annual Kappa Kappa Psi/Tau Beta Sigma formal. Our congratulations go out to Dean Surface and Courtney Smith, Baylor's newest engaged couple. 04/28/2001 - Priscilla and Rudy participate in the Race for the Cure. Priscilla walked in the 1 mile walk and Rudy ran in the 5K run. 05/05/2001 - Priscilla, Rudy, and Rey spend the day shopping at the San Marcos outlet malls. Much love to Jonathan and Kerry Jo, who announced their engagement today! 05/06/2001 - We've been together 4 months today!! 05/09/2001 - Priscilla made a yummy dinner for Rudy tonight. Afterwords, they played the game of Life, where Priscilla was a doctor and Rudy was a cop. 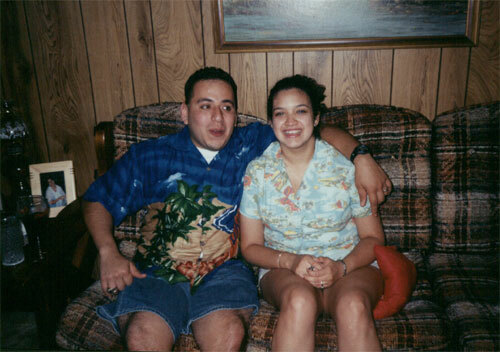 05/12/2001 - Priscilla and Rudy have an awesome time in New Braunfels, watching the Mummy 2 and attending a 15, where they lost some teeth after eating the sweetest cake in the world. 05/19/2001 - Priscilla and Rudy attend game 1 of the Spurs-Lakers Western Conference finals. Because of a few new ticket rules, we sat waaaay up top, behind the curtain, but we still have a great time. 06/01/2001 - Priscilla turns 21 today! We share a romantic meal from Sonic while we watch Abrazame Mui Fuerte. 06/06/2001 - We've been together 5 months today!! 06/16/2001 - Priscilla and Rudy have a fun time exploring Austin. We stop for some margaritas at Chuy's and discover Jenna Bush wasn't missing much. 06/22/2001 - We visit our friend Rachel at her new place. While there, we watch some croc's getting it on and pick pockets in Europe. 06/23/2001 - We have a full day today! We get on the ball and register at Target, visit friends, and have a great lunch at Ninfa's with Priscilla's room mate, Carissa. We then have a relaxing dinner at home(Sonic, of course) and watch our novela. 06/24/2001 - We register at Wal-Mart for our friend's and family's convenience. 06/25/2001 - 11 months until the big day! 06/30/2001 - Priscilla surprises Rudy with a picnic at the fountian. She made some yummy hamburgers and some guacamole dip. We then waded in the refreshing waters of the fountian. 12/01/2001 - After a nice lunch at the Macaroni Grill, and some Krispy Kreme doughnuts, there is talk of a new car in our future. Lets see what develops. . .
12/6/2001 - Rudy's and Priscilla's 11 month anniversary. 12/14/2001 - Priscilla and Rudy ate an Atkin's delight dinner from Denny's, and then we went to Target and Wal-Mart for some Christmas shopping. 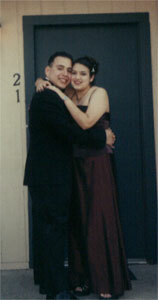 12/15/2001 - Rudy and Priscilla went to San Antonio for Priscilla's friend's graduation party from UTSA. Then we went all over town looking for an air matress for Priscilla's parents. 12/16/2001 - Rudy and Priscilla spent a wonderful day at her parent's house. 12/22/2001 - Today, we go see the Nutcracker in San Antonio. 12/23/2001 - We celebrate our Christmas early, today in Austin. 12/25/2001 - 5 months until the big day. 12/30/2001 - Today, we ate a huge lunch at the Golden corral!! Later, we go shopping all over Austin, including Target and Old Navy. 01/01/2002 - Happy new Year!!! 01/03/2002 - More shopping in Austin tonight, including Christmas trees and wedding rings. 01/04/2002 - Rudys list of movies he still wants to see gets a little smaller tonight, after watching Blow. 01/05/2002 - Priscilla and Rudy experience heaven after some professional theraputic massage in San Antonio. 01/06/2002 - We've been together for one year today!! 01/12/2002 - We finally watch Lord of the Rings in Waco. Priscilla makes a yummy hamburger dinner tonight. We then goto the Mall and Barnes & Noble. 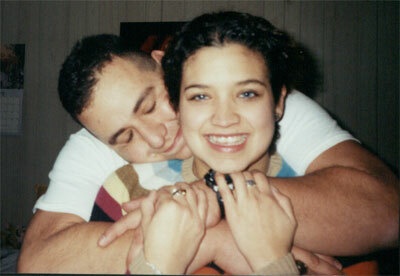 01/13/2002 - TOday, our engagement announcement appears in the New Braunfels Hearald-Zeitung. However, there is nothing like some Golden Crisp Chicken the day before school. MMmmm. 01/19/2002 - Priscilla brings Rudy some heaven from Waco: A Burrito King burrito. We also pick out the Tuxes for our wedding. 01/20/2002 - We spend the Day in New Braunfels today. In the end, Rudy goes home with a new bike. 01/21/2002 - Nothing like a Buffet to Celibrate MLK! 01/25/2002 - 4 months until the big day!!! 02/01/2002 - We take it back to the 1990s with some Super Mario Bros 3. 02/02/2002 - We work on the wedding all day while we jam to the hits from 1999! Check out the wedding section for a map to our wedding, too. 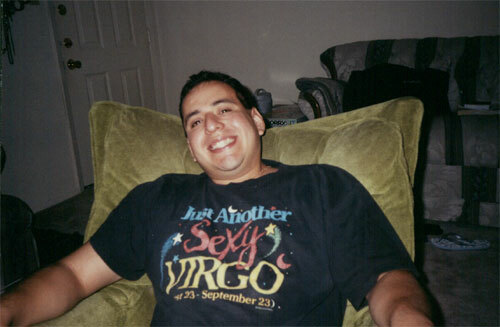 02/09/2002 - On our way back to Austin, we do some shopping at Garden Ridge in the afternoon & Target that night. We also talk about Priscilla maybe getting a new VW Beetle. 02/10/2002 - We enjoy some Red Lobster, today after church. 02/16/2002 - After Rudy plays at courtside, we goto a nice dinner at Buzzard Billy's and rent Chocolat. 02/17/2002 - After church, we stop by La Fiesta., where we run into Tim, Archer & Clint. Rudy also stops by & watches the MCs chalk in front of Waco Hall. 02/23/2002 - Nothing like a midnight breakfast at IHOP. Afterwords, we face off with another game of Uno. 02/24/2002 - Today, we have a great lunch at Ninfa's and Priscilla starts packing her things for the big move in. 02/25/2002 - 3 months until the big day. 07/01/2001 - We have a long, fun day today. From a big breakfast in the morning, to watching Atlantis at night, we have fun all day. 07/02/2001 - Rudy gets his hair cut by Priscilla today. No stitches were needed. 07/07/2001 - All work today at the Annual midsummer BUGWB meeting. 07/14/2001 - The color guard try outs go well today and we watch The Score that night. 07/21/2001 - We have a great time with all our friends at Eric and Misty Newsome's wedding today! Later, we goto see America's Sweet Hearts. 07/25/2001 - 10 months until the big day. 07/28/2001 - We have fun in New Braunfels all day today at a wedding. The day would not be complete without a haircut. 08/03/2001 - We have a blast watching Rush Hour 2 today. 08/06/2001 - We've been together 7 months today. 08/07/2001 - Priscilla surprises Rudy with a yummy dinner tonight. And of course, another hair cut. 08/11/2001 - Rudy welcomes Daphne and Erin to the neighborhood by helping them move into their new apartment right across the street. 08/12/2001 - Priscilla and Rudy have a fun night watching American Pie 2. 08/19/2001 - We have a full day today. We start the day with some Super Tacos. We do a little shopping for "Pretty Rudy." We then take a road trip to San Antonio to visit Priscilla's brother and have fun along the riverwalk. 08/20/2001 - In the wee hours of the morning, Priscilla trims Rudy's hair. 08/21/2001 - Our web site has 1,000 Hits!! 08/25/2001 - 9 months unitl the big day!! 09/06/2001 - We've been together 8 months today!! 09/08/2001 - We watch the Baylor Bears beat Arkansas State 24-3! 09/20/2001 - Rudy tips the scales at 199 pounds today! 09/22/2001 - Rudy turns 24 today!! We watch the Baylor Bears beat the New Mexico Lobos in overtime 13-13. After the game, Priscilla's family and room mates throw Rudy a surprise birthday party!! 09/25/2001 - 9 months until the big day!! 09/28/2001 - Priscilla and Rudy watch another New Branufels High School football victory tonight. 10/06/2001 - We've been together 9 months today!! 10/06/2001 - Today, the Aggies steal one from the Bears in College station, 16-10. Later, we celebrate our anniversary at Buzzards. 10/13/2001 - We watch the Huskers lay the smackdown against the Bears 48-7. Rudy and Jon Duty also get the VIP treatment in the press box and watch half time from the photo deck. Later, we hang out at Papa Rollo's with our Tau Beta and K Psi brothers and sisters. 10/14/2001 - We experiment with Golden Crisp chicken(You know, livers and gizzards 99 cents) which is actually very good and cheap. 10/20/2001 - We have a blast today at our Houston wedding shower. Thank you to all who came. 10/25/2001 - 7 months until the big day! 10/26/2001 - We catch the Baylor spirit again at the annual homecoming bonfire and have fun hanging with Calina and Josh at After Dark. 10/27/2001 - We have a long day today. We get up extra early for the homecoming parade. After watching the Baylor Bears fall to the Texas Tech Red Raiders, 19-63, we go out on a nice date to the Olive Garden. 10/28/2001 - After church, we pick up some Churches chicken and head out to Lovers Leap for a mid-day picnic. 10/31/2001 - At the annual Tau Beta Sigma crush, we make an Osama Bin Laden jack-o-lantern. Afterwords, we sacrifice the Bin Laden jack-o-lantern to the river. 11/02/2001 - Rudy experiences pure bliss when he attends a Tori Amos concert tonight. 11/03/2001 - Today, after a big breakfast at Harold Weights, we watch the bears fall to UT, 49-12. Later, we spend a relaxing night at home, doing homework and watching movies. 11/09/2001 - We dance the night away at the annual Swing Dance. 11/10/2001 - Priscilla gets up extra early to clean the Tau Beta highway. Later, we have a big lunch at Ninfas, where we run into some friends. We then do some shopping and go to the movies in the evening, to see Domestic Disturbance. 11/11/2001 - We make a turkey dinner for us and our friends this afternoon. 11/17/2001 - Priscilla's last Baylor game. We went to Harold Weights for breakfast, and then we watched Baylor lose to Oklahoma State. 11/22/2001 - Rudy went to his parent's house for Thanksgiving and Priscilla went to see the Dallas Cowboy's football game with her brother. 11/23/2001 - Rudy purchases a Gamecube with Madden 2002 today. That night, Priscilla becomes the premier running back in the NFL. 11/24/2001 - We have a big thanksgiving lunch in New Braunfels, today. Afterwords,we take our real engagement pictures, in San Antonio. 11/25/2001 - Six months until the big day! !